As a serial killer terrifies the San Francisco Bay Area and taunts police with his ciphers and letters, investigators in four jurisdictions search for the murderer. The case will become an obsession for four men as their lives and careers are built and destroyed by the endless trail of clues. 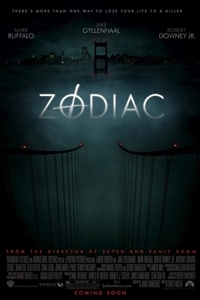 Zodiac won’t only leave you thinking about the title killer and his cold case, but also David Fincher's amazing ability to genre-hop within the confines of one movie.